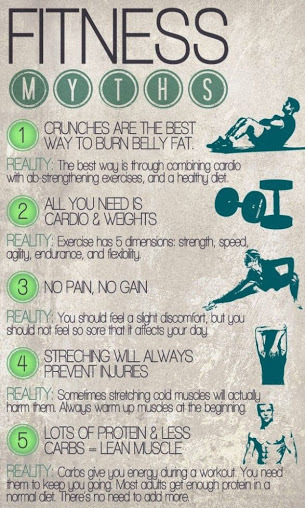 If you believe any of these myths, you might not know anything about Fitness. Hell- If you believe this Infographic, you probably still don’t know much about fitness! Just because you saw a cool pic on twitter doesn’t mean it’s right. Awesome Steph! I am so happy you are on board with the Great 8! Please do continue to share your exeinperces along the way.Here is a Secret too for an even more speedy successful weight/fat loss: Ad an intermittent fasting aspect into the program and do at least 3 or 4 night a week with Nothing to eat or drink other then water/lemon or vinegar past 6pm. Nothing. Then the next morning after 6am. have your nutritious replenishing breakfast knowing that it is the most important meal of the day! Do this for at least 2 weeks and watch/feel the difference! Shock n Rawk On!! Next story Eating Healthy is Definitely More Expensive…but is it?